Spinal cord injuries have a devastating effect on the lives of the people afflicted, along with their family and loved ones. Spinal cord injuries are characterized as either non-traumatic or traumatic. Non-traumatic injuries are the result of slow internal damage to the spinal cord region. On the other hand, a traumatic spinal cord injury may stem from a sudden blow or damage to the spine that impacts one or more of the vertebrae, ligaments, or disks of the spinal column or to the spinal cord itself. When the spinal cord is damaged, nerve impulses cannot communicate below the area where the damage has occurred. This typically results in the loss of motor function, sensory function, or paralysis. While the specific symptoms depend on the severity and location of the damage, a spinal cord injury will likely follow the victim throughout his or her life. According to the National Spinal Cord Injury Statistical Center, around 17,500 new spinal cord injury cases occur in the United States each year. One of the more troubling findings of the study is that it can cost more than one million dollars for the first year of treatment for someone who suffers from a traumatic spinal cord injury. Each year afterward, medical bills are typically more than $187,000. If a person suffers a spinal cord injury at an early age, the medical costs are enormous. Motor vehicle accidents are the leading cause of spinal cord injuries, accounting for about 50 percent of cases. Slip and falls are the second most common cause of spinal cord injuries, accounting for about 24 percent of cases. Acts of violence or assault (primarily gunshot wounds) account for approximately 11 percent of cases. Sports-related accidents and other recreational activities account for about 9 percent of cases. Other causes of spinal cord injuries include medical or surgical malpractice, and diseases such as cancer and osteoporosis. What to do Following a Spinal Cord Injury? Spinal cord injuries can have a devastating effect upon the life, health and personal autonomy of the injured person. This is why it’s important to seek experienced and trusted legal counsel immediately after an accident that causes a spinal cord injury. 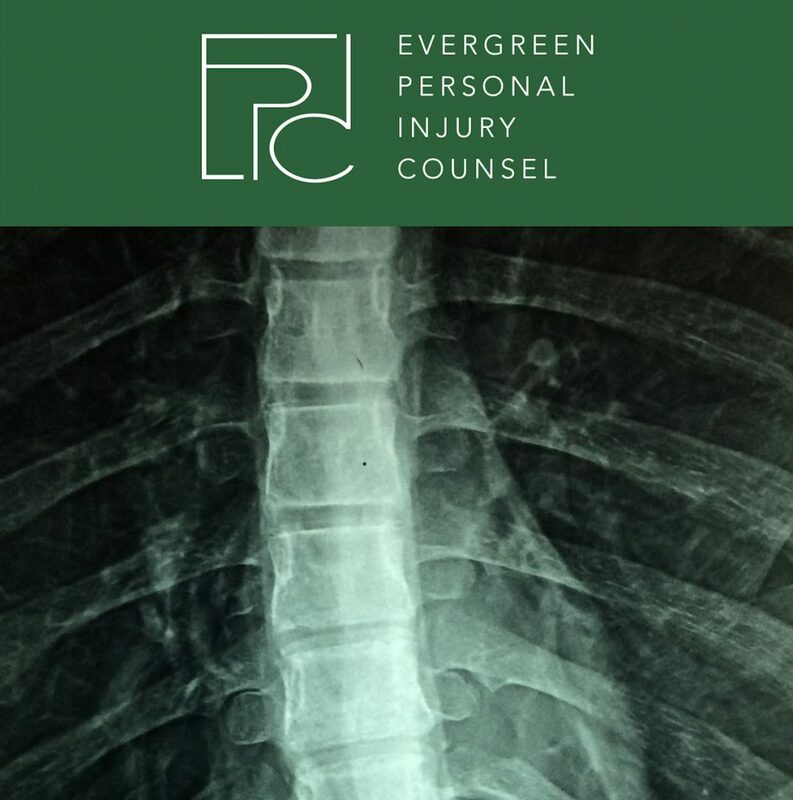 If you or a loved one has sustained a spinal cord injury, contact Evergreen Personal Injury Counsel. We understand the far-reaching impacts of this type of injury. We are more than willing to come to you and your family to discuss your options. Our attorneys will work hard to get you the justice that you deserve. During your free consultation, a Tacoma injury attorney will answer any questions you may have and discuss your options for moving forward.